Over the summer the Museum of Contemporary Art at The Geffen (MOCA) in Los Angeles held the "Art In The Streets" exhibition (April 17th 2011 - August 8th 2011). The exhibition catalog covers lots of ground throughout the world of graffiti and street art but as with any book on this subject it is very difficult to cover every single aspect of it. The catalog is 320 pages of essays interviews and photos of the street art and graffiti movment, it is available in hard and soft cover and is still available to be purchased from Amazon.com. The catalog works more like a history book on the street art movement. It does its best to hit every major aspect of the community. The catalog is organized by chapters of place ranging from New York, Los Angeles, San Francisco, Sao Paulo, London, a collective chapter of Paris, Bologne, Munch, Athens, and Ghent and a final chapter on Tokyo. The catalog has more separations between the global chapters seperated into artist portfolios that were featured in the exhibition. Within each global chapter they go into more sectioning of each place (such as New York to Keith Haring or Cholo graffiti in Los Angeles). This catalog was captivating for me because of all the great photos they collected through working closely with the artists that were in the exhibition, but it also reads differently than other street art books i have seen. In this catalog the artists interview and have conversations with each other. Comparing this catalog with many of the other street art books that are out there (except a few) and you will notice that they are usually filled with essays by people who only view the scene from the outside or have only the information people on the inside (of the graffiti world) are willing to give them. This book has a one to one interaction with street artists spanning many years. 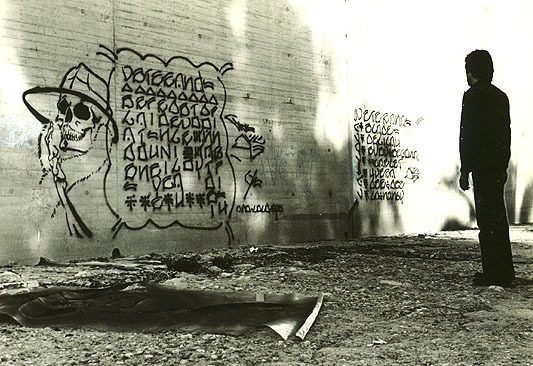 Arguably the most influential art movement since Pop, Graffiti - as we know it today - was invented by teenagers...It continues to thrive and evolve forty years after it began"
This is a good argument as to why this exhibition and catalog are important. The street art and graffiti movement is one that has only been expanding and changing during our generation and as of yet seems to have no ending. Even by looking through this blog and many other art blogs it will be hard to find anywhere that doesn't at least mention the words "street art". As a side note to the catalog and the exhibition, there was controversy that surrounded the MOCA "Art In The Streets Show" with artist Blu and his large mural that he did for the exhibition, turning many fans of graffiti and street art against the shows organizer and catalog writer Jeffrey Deitch.